Caleb has been practicing, and this year he is going to win at the dreidel! As schools seek to teach about diversity and tolerance, it is essential that students learn about holidays that span the many cultures of America and beyond. Caleb’s Hanukkah is a fantastic book for introducing a young elementary class to the basic principles of Hanukkah. Second graders will find this book easy to follow and comprehend. It is structured in a short chapter format, and on each page, there is information that relays Caleb’s story and Hanukkah traditions, but each page also has notes in tabs that offer detailed explanations about various aspects of Hanukkah. The storyline of this book would be well-suited for reading aloud, but the information tabs are better for individual reading. I love that this book introduces the Jewish history behind Hanukkah and not just the ways that contemporary Jews practice Hanukkah. As a follow-up activity after reading Caleb’s Hanukkah, it would be fun for the class to learn how to play dreidel. A second-grade class is old enough to learn and understand the rules, and reading about Caleb’s dreidel, students’ interests will be piqued. They will definitely want to visit www.dreidel.com/rules/php to learn the rules only vaguely outlined within the story. If students become really efficient at playing dreidel, it would really entertaining to have a tournament at recess! Students may also benefit from the various resources available at www.lerneresource.com, the website owned by the publisher. This website offers free education resources for all ages. 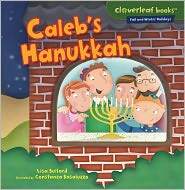 Caleb’s Hanukkah and the entire series of holiday books by Cloverleaf Books provide useful and relevant information for any elementary classroom.